Need a quick and easy Valentine recipe? 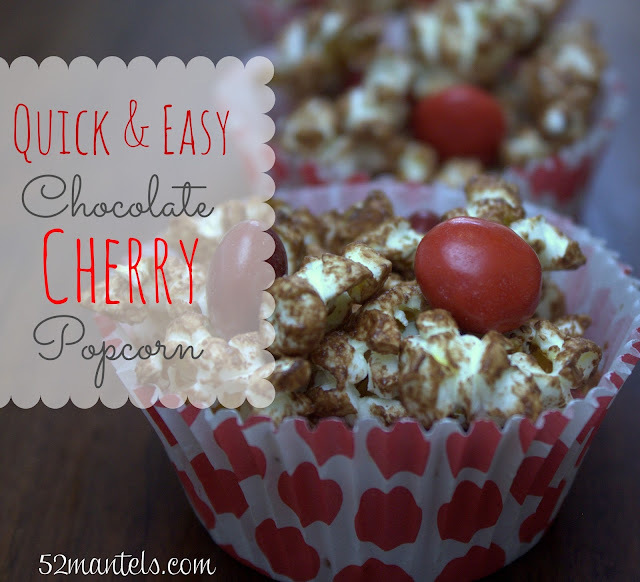 This Chocolate Cherry Popcorn is the perfect treat for your upcoming Valentine's Day parties AND it would be great as a sweet gift for that sweet person in your life. Best part? You can make it in about 5 minutes! This recipe is made with the special edition cherry M&M's. Have you seen them?? To me, nothing says Valentine's Day like cherry and chocolate and these M&M's are delicious! Of course, if cherry isn't your thing, this recipe can be made with any flavor M&M's and for any holiday or occasion. Serve them up in pretty cupcake liners for easy-peasy party presentation! Place chocolate chips and 1/2 C. of the M&M's in a large, microwaveable glass bowl (that can accommodate at least 9 cups). Melt the chips in 20 second intervals, stirring between cycles. Gently mash M&M's as you stir. 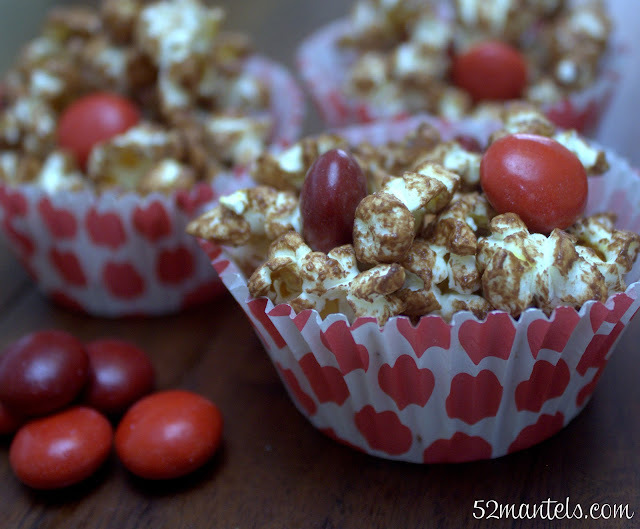 When chocolate is melted and M&M's are broken up, stir in popped popcorn. Stir until popcorn is evenly coated in chocolate. Immediately stir in remaining M&M's. Let cool before placing in cupcake liners. I hope you enjoy this yummy treat! Emily, I just had chocolate popcorn for the first time over Christmas and loved it! Chocolate and Cherries....yummmm! Pinned it and will be trying it soon. Thanks for sharing! Oh. my. word. I want some NOW. Putting M&Ms on the grocery list. Thanks! Hi Emily, this sound scrumptious! I didn't even know they HAD cherry M&M's!!! I am SO getting some and this sounds like a possible fast yummy snack option for Super Bowl! Thanks for sharing and for the M&M intro! YUM! This looks and sounds wonderful Emily! Thanks for sharing! That looks so yummy! I love anything with cherry and chocolate! Thanks for sharing! Mmmm! Seems sooooo good!!!! It must be delicious!!! Love cherry chocolate stuff, but wouldn't have thought to put it on popcorn. yum! Those chocolate cherry m&ms are amazing..I've got to try this popcorn! Thanks for sharing at the Loving Valentine's Day Party!